An industry advisor has developed a new checklist to help agency leaders assess their business’s performance and highlight early warning signs of distress. Navigator Consulting MD Tony Hall created the 10-question survey to help leaders identify specific areas where there is room for improvement, and recognise potential problems early. With sustained economic growth resulting in profitable performances for many recruitment agencies, now is not the time to be complacent, he warns. “A lot of people think their recruitment company is doing really well, so I really thought about the 10 most important questions owners should be asking themselves to really benchmark whether the business has potential for improvement and as a reality check to whether it is performing well,” Hall explains. Is your gross profit/net profit margin greater than 25%? Is staff turnover less than 10% per year? Are your average debtor days owing less than 35 days? Is not more than 15% of your net revenue or billings from a single client? Hall says recruitment agency owners and managers doing the survey should consider 80% a “pass mark” to feel comfortable and start developing strategies around improving weaknesses in the business identified by the survey results. Anything less than 80% calls for a serious assessment of the business. “Profit margin needs to be greater than 25% to be a high-performing recruitment business,” he explains. “And staff turnover, some people think it’s acceptable for 40% staff turnover because they are still doing well financially, but that’s actually not acceptable for so many reasons. “The last [question] is a psychological one, which people don’t think about as much: does your business keep you up at night? Do you worry about all the things you have to do, the problems you have, the staff issues, the cashflow problems?” he says. Hall, who has 20 years’ experience consulting to the recruitment sector, admits not everyone will feel comfortable to honestly assess their business. 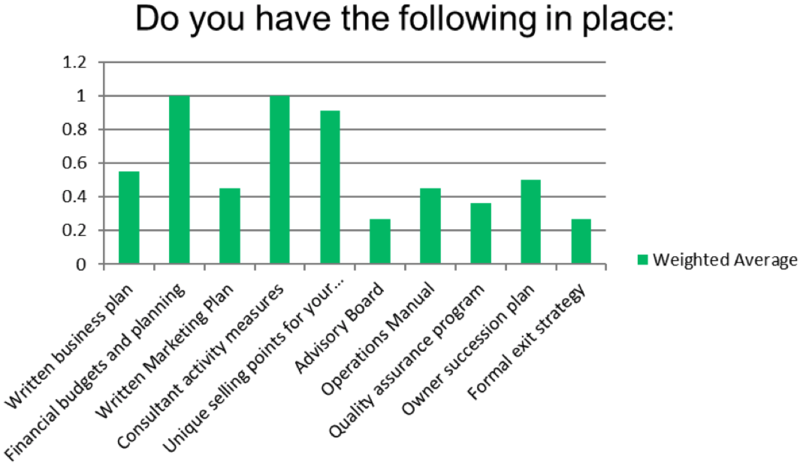 At a recent Captain’s Table event, Hall asked attendees if they had a business plan. Of the 25 or so people in the room, just one hand was raised. “A lot of people are doing kind of well and they are not in ‘business improvement mode’ right now,” he says. However, he adds that now is the perfect time to build a solid foundation to sustain a recruitment business through any potential economic lows. “I think it’s a really good time to get some strong financial reporting in place now so that if the market does change, you have plenty of warning and you can adjust accordingly,” Hall says. “What can happen, is if you don’t have good financial reporting in place and the market changes, by the time you realise there is a problem, you are six or seven months down the track and it takes longer to adjust. The survey was built during the development of Navigator’s new Recruitment Business Accelerator Program, which covers 10 topics, he says. Recruitment leaders are wasting too much money and effort on marketing that doesn’t align with their business fundamentals, often blindly following trends that deliver little or no return on investment, according to an industry advisor. “Technology is a really easy way to get caught up in a [marketing] hype cycle,” Navigator Consulting director of marketing and research Matt Fink told a recent Captain’s Table event. By way of example, Fink draws on his own experience as head of marketing for a multinational office supplies business, where he took three-to-four months to define and accurately work out the return on investment of a marketing automation platform – during which time he was fielding daily sales calls from providers trying to sell him the latest and greatest platform. And while marketers are very good at finding the next opportunity, they don’t necessarily look at the things that haven’t worked as well, Fink adds. So when looking into the ‘next big thing’ in marketing tools and technology, he suggests leaders spend as much time looking for what doesn’t work with the technology as what does. Another mistake agencies make is failing to differentiate their service offering from the rest of the market, particularly through company websites. Going further, he says there is often inconsistency between how leaders or owners describe their service offering compared to other people in the business. Marketing and sales need to be in concert with all parts of the organisation, he adds. If organisations take the same approach with marketing for every client and candidate, without taking into account variables around who they are and what makes them unique, this leads to another key marketing faux pas: misalignment. When alignment between business functions breaks down, Fink says organisations end up producing marketing material that doesn’t support the sales effort and drive value within a business. It also makes them more susceptible to marketing phases and fads. Instead, he reminds leaders to keep marketing strategies simple, and keep them aligned to the business. Act now, prepare for tomorrow. Matt presented at Navigator Consulting’s recruitment industry leaders forum – Captain’s Table, kindly supported by Job Adder and A Positive. Is The 360 Recruitment Model Broken? Recruitment’s shift away from employing ‘outdated’ 360-degree consultants is potentially the most important transformation the industry will face, according to an advisor. Agencies are increasingly deconstructing the 360 model, breaking the process into admin, resourcing, recruitment and sales roles, though with varying degrees of success to date, he notes. Many labour hire companies have been operating in this way for years – “they have business development managers that understand the industry really well… and they might even be from the industry they are selling into, so they’ve got a lot of credibility” – while larger agencies are more likely to succeed with dedicated business development managers, following the US blueprint. For smaller firms, Hall recommends the most senior people spend their time out in front of clients, and avoid putting junior consultants into “difficult sales situations that are way over their head”. Small companies should be hiring people into resourcing or account management roles, to start, while senior leaders outsource their resourcing so they are freed up to do the sales part of the 360 process. “If there’s no sales responsibility for a recruitment consultant, then their commission structure should be at a lower level than a recruitment consultant that’s required to bring in the business and fill the role as well,” Hall says. Breaking out the recruitment process also provides career progression, which Hall says is sadly lacking in the industry. Then focusing on supporting high performers, rather than underachievers, will keep them performing and encourage them to stay. Hall is facilitating discussions on the “obsolete” 360 model, and its alternatives, at upcoming Captain’s Table events in Melbourne (30 October) and Sydney (31 October) for agency owners and leaders. https://www.navigatorconsult.com/wp-content/uploads/2015/08/logo1.jpg 0 0 Tony Hall https://www.navigatorconsult.com/wp-content/uploads/2015/08/logo1.jpg Tony Hall2018-10-05 08:54:352019-03-21 12:06:43Is The 360 Recruitment Model Broken? Great recruiters who bill well and stay for many years are now rare as hen’s teeth. They are unlikely to move from a profitable and happy desk which they probably built themselves over considerable time. Next step for them is promotion into a director role or starting their own business so they can enjoy a higher percentage of the fruits of their labour. Industry demand for recruitment consultants is huge, with over 1958 jobs currently advertised on Seek. Every agency is after the perfect recruiter who is good at selling, admin, resourcing and recruiting. Furthermore, they must be resilient, persistent, communicate well and bring a network with them and of course fit your current team culture. It seems absurd that any one person has all these attributes – yet that is what many recruitment firms are still looking for – hen’s teeth. Firms insist the people they hire have all of the above and bill 3-4 times their salary in the first year. Again – impossible. The only source of experienced consultant supply is from industry staff turnover which continues to push 50% due to a suspected combination of poor hiring, training and development. It is time to think differently about business growth and look at alternative strategies for bringing on new talent. Solution #1 – Break up the highly complex recruitment process into admin, resourcing, recruitment and sales as it is much easier to find people good at one (not all) of these activities. They can be sourced from within or outside the recruitment industry. A quality recruitment process will have around 50 steps which requires specialist expertise at each stage. It is unique to the recruitment industry in Europe/Australasia that we persist with the 360 model of trying to find consultants who can sell, resource and perform accurate admin despite the proven benefits of the US model which separates sales, recruitment and admin processes. Solution #2 – Offshore low-level admin and sourcing tasks to save money and free up your senior staff to spend more time in front of clients and candidates where the real action (and revenue) happens. Our clients who have taken on experienced offshore resourcers have benefited from considerable improvements in client, candidate and staff satisfaction with the added bonus of significant cost reductions and revenue increases. Solution #3 – Free up your senior managers to spend much more time in front of clients and candidates. They are much more credible and will find the sales process easier and faster. Forcing inexperienced, junior recruiters to cold call or visit clients can actually damage brand and industry reputation if they are not well trained, knowledgably or have specialist networks. Senior decision makers will always buy more from other senior decision makers and often find it insulting if a poorly trained junior is sent in their place. Also, your senior managers are paid way too much to be stuck in the office running unproductive meetings or administration tasks. Get them out generating revenue and building your brand instead – the return on investment will be so much higher. Solution #4 – Appoint your managing director as chief sales officer. He or she will find it easier to secure meetings, easier to close complex sales and will be revered by the team for bringing in large pieces of new business. Great recruiters who are not suited to sales will be happy to fill these new roles and are more likely to stay longer and enjoy higher job satisfaction if they are not forced to do activities they are not good at. It makes no sense for a MD or CEO earning big money to be stuck in the office day in day out performing low level admin tasks and pointless meetings. The real money (and fun) happens out in the market in front of senior prospects, clients and candidates. This additional sales activity will translate to pure profit small, medium or large companies alike. Solution #5 Hire biller leaders instead of unproven consultants – I believe you will receive a much bigger return on investment with lower risk by hiring proven leaders who can quickly attract clients and staff rather than unproven recruiters with a limited network and track record of success. Leaders with 6 years or more experience are much more likely to grow the business and cover their costs faster. Solution #6 Develop a graduate program. Here is your chance to shape your own high performing recruiters before they develop bad habits and dangerous short-cuts. It does take time to break-even on a graduate, but time flies and before you know it your best graduates are building and running their own teams. Graduates will require a strong training program and well mapped-out career plan. With such a shortage of recruiters this is an important strategy to mentor and grow your own talent. Solution #7 – Regularly train the skills you require of great recruiters. Even the most experienced consultants will fall into bad habits and need refresher training. Inclusive training brings your team together, sharpens their skills and allows senior people to help pass on knowledge to rising stars. One of the biggest recruitment company turnarounds I worked on was hugely successful almost solely due to the implementation of a well-run weekly interactive team training session. Solution #8 Attend a big conference in the US. You will pick up so many new ideas and techniques from recruiters in the highly competitive US market. They are famous for owning their specialties, building very close relationships with their local communities and using a sales driven account management approach to secure new business and grow existing customer bases. For over 10 years the Americans have also perfected offshore resourcing in India and particularly the Philippines. There is a massive well educated and trained recruitment resourcing market in Manilla keen to move out of the US night shift to work for Australian companies in a similar time zone. Solution #9 Stop micro managing and start quarterly goal setting and planning. Sit with your people, determine their strengths and weaknesses and make sure you are not forcing them to perform tasks they hate and/or are not good at. Instead of confronting old-school performance appraisals, consider individual quarterly business plans that clearly define goals, targets and activities required for success. Staff will own this plan if they feel involved in mutually setting goals and will work harder to achieve results if they feel supported and listened to. Set simple activity targets that will eventually lead to a placement every week – for example 4 unique client/candidate interviews. Nobody likes micro-management (MM), yet many firms still persist in this activity as a misguided form of risk management which counter-actively results in staff dissatisfaction, turnover and poor employee attraction when MM word gets around. Solution #10 Support the great people you already have. Most managers end up spending all their time trying to turn around under-performers then are shocked when one of their best people resigns. Contrary to instinct, managers must spend most of their time supporting their best performers who are a big loss if they leave and are much more likely to increase performance year on year than the marginal low performers who typically shout out for more attention and cause everyone the most grief. Solution #11 Establish a commission/bonus plan that is simple, regularly celebrate and reward people who make an additional effort to do more than the job they are paid a salary for. Pay incentives for new business, innovation, efficiencies, cost savings or activities that are over and above what is required by an average performer – even for junior support staff. Avoid over or double paying incentives for work brought in by senior managers or sales people and then filled by non-client facing staff. Incentives should be paid for extra effort and contributions to the over-all business. Solution #12 Consider part-time and work from home options for proven performers. Experienced high billing recruiters are so hard to find that it is worth providing flexible work alternatives so long as they are productive, have agreed goals and don’t disproportionately draw on company resources. Several recruitment firms have built highly profitable businesses around experienced part-time working mothers job sharing. For more ideas on business growth advisory, recruitment industry staffing solutions, remuneration structures, offshore resourcing or business and performance planning please make contact anytime. The biggest threat to the recruitment industry is the increasing number of employers bringing recruitment in-house, and emerging technology is the additional impetus for making agencies the second option, an industry advisor says. At a recent Captain’s Table event, chaired by Navigator Consulting CEO Tony Hall, agency leaders gathered to discuss the biggest threats to the industry, and what to do about them. Several key themes emerged as attendees discussed what the industry should be doing to counteract the growing number of clients that are bringing recruitment functions in-house. The first step is to build stronger relationships with clients, Hall says, “so we as recruitment agencies are the first port of call, as opposed to the last port of call, when it gets too hard for them”. Filling more jobs is absolutely critical in encouraging companies to use agencies more, the leaders agree. Leveraging technology well enables better recruitment service delivery, Hall says, and points the way to adding more value for clients, “so we can justify the high margins that we would all like to have”. Painting a fuller picture of exactly what it is that agencies do and the effort required to fill a role is also vital, as is communicating that effectively to clients, says Hall. “Are we articulating how much work goes into a recruitment assignment?” he asks. This should start in client proposal documents that outline all client services at beginning of an assignment, and be reiterated through detailed invoices that provide a list of services involved, line by line. “That’s just absolute gold,” Hall says. Hall urged recruiters not to send invoices that simply say, “recruitment fee, $35,000”. Getting out and meeting clients face-to-face to build relationships is the optimal way to get their buy-in. “Recruitment consultants now are relying on email, phone, LinkedIn, whatever, way too much, at the detriment of relationships, perhaps,” Hall adds. A more organised approach to industry collaboration – rather than purely focusing on competition – is more beneficial to recruiters, says Elias Recruitment CEO Jason Elias. Efforts to win work on an exclusive basis are a better driver of competition than fighting over the same vacancies simultaneously. “It’s great for job boards [but] candidates get confused when we all fight over the same people,” he says. “As an industry, we shouldn’t be like seagulls going for little chips,” says Elias. Australia’s unemployment rate is close to a 10 year low of 5.4%. It is often argued we are actually close to full employment because a large portion of this group choose to remain unemployed for many reasons. Over the past 12 months, there have now been 239,373 jobs created, in seasonally adjusted terms, at an annual growth rate of 2% – up from 0.9% in February. A quick look at seek.com.au shows a whopping 168,173 job openings Australia-wide. Engineering, construction, mining/resources, energy, infrastructure, ICT, healthcare, manufacturing, transport logistics and trades. If you are supplying to these sectors it is prudent to stand out from your competitors and maximise new business efforts while the market is strong. Retail is under considerable pressure due to the convenience and low price of online shopping, with weakness in this sector unlikely to improve. While NSW and Victoria continue to dominate, QLD remains strong and double digit recoveries in job advertising were reported in WA and SA. For firms looking to source staff, the market is now competitive as many previous economic boom times. Growth is likely to become restricted by the lack of supply of talent with specific skills in new business development. 1. Advertising – fast and low cost but patchy responses and only attracts candidates actively looking for a new job. The only way to profitably grow any business is to maintain operational efficiency and add high performing staff. Staff turnover is inevitable in such a strong market which makes new hiring activity and even higher priority. Tony Hall is Managing Director of business growth consulting firm Navigator Consulting. Great Value – only $50 including lunch. – Industry round table for astute owners and leaders of quality recruitment companies. Please join us @Gumtree Australia for a powerful discussion with industry M&A specialist Andrew Cassin who shares his insights into building your recruitment business into a valuable asset. People start their own recruitment company for many reasons – dissatisfaction with a current employer, wanting to try a new way or the desire to build their own company. Many also start one with the aim to build an asset to sell later and retire early. That goal is in reach of every recruitment company but many fail to take the necessary steps to achieve it. The company you started becomes just another job with with so much administration and little time to work on the business itself. Industry growth consultant , Andrew Cassin will share his practical knowledge gained over many years of experience into how you can transform your company into a powerful asset. – Please book in quickly to gain the knowledge, insights and practical tips to grow your business. Andrew commenced his consulting career in 1993. Since establising Acquisiti, he has been retained as a consultant by dozens of business principals, completed business sales & capital raisings and facilitated mergers & acquisitions for SME clients. Captain’s Table is a professionally-facilitated forum for owners and leaders of recruitment businesses. Attendees are encouraged to share experiences and engage in discussions. As an industry knowledge group session, the attendees help shape these monthly meetings and content is developed in-line with the feedback of the attendees to ensure that the events are topical, interesting and meaningful for attendees. People leave companies for many reasons. Conversely there are many reasons people stay. We have researched numerous HR articles from around the globe to provide a summary list of the best ways to retain great people. – Do you have a clear career path for all staff? – Ensure reporting and communication lines are clear and adhered to. Knowledge is only power if we do something with it!